The Dixie Kats, centered around Ithica, NY, is best known as a concert, show, and dance band who play a variety of traditional Dixieland and Bayou Gumbo. Band members include David Plaine (leader, alto, baritone sax), Casey McDonald (vocals, trumpet), Dave Richman (vocals, guitar, banjo), Peter Forlano (clarinet, tenor sax), Bob Fisher (trumpet, flugel horn), Dana Paul (upright and electric bass), and Mark Sammo (vocals, electronic drums, percussion). We spoke with Mark to learn more about the Dixie Kats, and to share with you their passion for the music they play and what you can expect to see from them from during their performance at this year’s Festival. When was the exact moment you realized you and your band mates wanted to be musical artists? I am sure for each one of us the passions we feel about playing music in this and many other contexts, are highly individualized and perhaps very personal. Yet there is something that happens when everyone of the players in a musical group slips into the “zone” and there is no longer an “I,” simply a “We”… perhaps Dixieland music with the wonderful horn weaves is one of the places where the audience gets to really become a part of that “We” and join the musicians for a moment in the wonder of musical communion. We are all, for the most part in our mid 50s to early 60s and most of us began on our instruments in grade school and stayed with it up until the present. Music just is a part of who we each are and have been for most of our lives. We each bring a rich musical history playing many styles of music to the DixieKats, Dixieland band. Dixieland music is a true American Tradition. The history of Dixieland is a rich and intricate weaving of cultures and musical styles. The DixieKats have taken this rich American Tradition and incorporated both traditional and newer rhythmic styles of gumbo and Cajun and jazz funk into a varied and exciting program for listening and dancing pleasure. Our music is available on CD for purchase at our concerts or by order placing an order on our Web site. Additionally, the Web site hosts representative samples of our music in MP3, and some of our videos can be found on YouTube with links to higher quality videos, or from links on Facebook. We have become regional favorites in many of the regions premier summer outside concert venues. We were asked to play for the 2009 Centennial Celebration of the Milton Hershey School and Park at the Sports Arena in Hershey, PA, and were recently invited to head line at the Festival of the Flowers in Medellin Columbia in South America. This year we will be playing at the New York State Fair in Syracuse, NY. We are quite interested in making a tour of Europe and South East Asia and hope to in the near future. The rich musical history of America from early blues and African influences through to modern jazz and the arrival of rock n roll in the early ’50s through to today. Music is like breathing, like walking, like running, like flying and each type of music offers something unique to the celebration of simply being alive… even if it is some of the saddest or happiest music on the planet, Dixieland music incorporates musical styles from many different American traditions and roots music from all over the world. We continue to investigate putting together a tour of Europe and South East Asia. We are beginning to work on a new CD with will likely be called, “The DixieKats Play Traditional” as it will highlight many of our more traditional Dixieland music offerings. We feel that with every musical outing we bring seven dedicated musicians and entertainers who can get an audience moving even in a nursing home! We have one very talented singer and entertainer who can take over the stage and audience with an all out performance. This is Casey “Max” McDonald. “Max” is short hand for “Maximum all out performance and entertainment.” He really gets things cookin’. What’s one thing that you’d like people to know about you, that they may not already know? 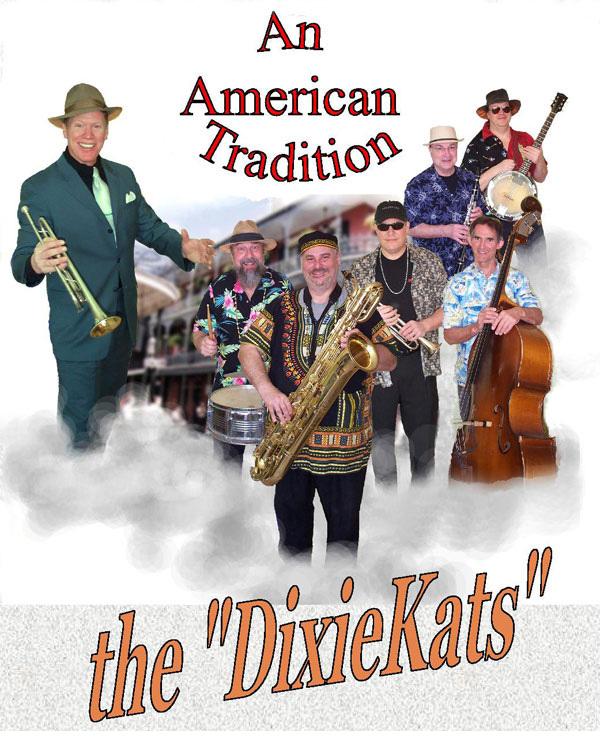 To hear the Traditional American sound of the Dixie Kats, you can visit their Web site, http://www.dixiekats.com, or experience them live on Saturday, July 17th, 3:15 p.m. – 4:30 p.m., on the Time Warner Stage.